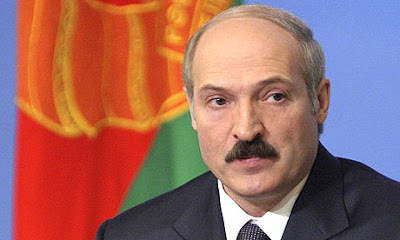 MINSK, Belarus -- Belarussian President Alexander Lukashenko on Sunday berated ally Russia for not paying for its military bases deployed in his country and warned that he could snub the summit of a Moscow-dominated security pact next month. Lukashenko, who has sought to improve ties with the West, bitterly hit out at Russia's gas-for-base deal with Ukraine. "I want to congratulate my Ukrainian colleagues on this victory -- they have saved a few billion dollars by signing this deal," Lukashenko told reporters. Ukrainian President Viktor Yanukovich, bargaining with Moscow for cheaper gas, agreed last week to extend the lease of Russia's Black Sea Fleet in the Crimea by 25 years beyond 2017, a move the opposition sees as Ukraine selling its sovereignty. "If someone has forgotten it, Russia has two military bases on Belarussian land," Lukashenko said. "And Russia pays us zero roubles, zero kopecks and zero dollars for these bases." "Besides Belarus, Russia has no one on its western flank." He said one of the bases was part of Russia's national ballistic missile early warning system, while the other provided communications with Russian submarines in the Atlantic. Russian officials say Moscow does not pay Minsk for the bases because Belarus gets Russian oil and gas at low prices, while Belarus says the lack of payment is due to a close military and political partnership between the two. Those ties have soured amid trade wars, Belarus's anger over what it sees as high prices for Russian energy and Moscow's irritation with Minsk's refusal to recognize Georgia's breakaway provinces of Abkhazia and South Ossetia as independent states. Adding further to tensions, Lukashenko has criticized Moscow's prompt support of Kyrgyzstan's opposition, which came to power after a bloody revolt this month. Ousted Kyrgyz leader Kurmanbek Bakiyev was sheltered in Belarus. Lukashenko threatened he would not attend an informal summit of the Moscow-dominated Collective Security Treaty Organization (ODKB) set for May 8 in Moscow, unless the issue of Kyrgyzstan's "coup d'etat" was included in the agenda of the meeting. Both Belarus and Kyrgyzstan make part of the post-Soviet security pact, along with Russia, Armenia, Kazakhstan, Tajikistan and Uzbekistan. "What sort of organization is this one, if there is bloodshed in one of our member states and an anti-constitutional coup d'etat takes place, and this body keeps silent?" Lukashenko said. "At this stage, there is no agenda (for the summit). If nothing is changed, I have nothing to do there." ODKB countries control a key land route from Europe to Afghanistan, and the group is often billed as a regional counterweight to NATO. In June last year Lukashenko snubbed an ODKB summit in Moscow over a milk export row with Russia. BELARUS PRESIDENT MAD AND UPSET!!! You really cannot blame Belarus President Lukashenko and this latest deal with Russia regarding the Russian naval base at Sevastapol has got to add to harsh feelings. The problem ofcourse is that oil and/or gas prices can fluctuate so much but the logistical,military value of Russias 7th Fleet being staged in Sevastapol has no real price tag and if anything for strategic reasons the value for Russian positioning can only go up and Yanukovich will be long gone when that lease runs out. Ofcourse,another violation of a precept of the Ukraine constitution. But Lukashenko and his country has always been closer to Russia and they still get less and are now closer to Russian problems. After the attack by Russia in Georgia and for other reasons I have a feeling that Lukashenko and Yanukovich may develop some idealogical differences as time goes by. Ukraine and Belarus, so we should watch closey especially after this latest coup in Kyrgistan,not to mention all of the former fifteen breakaway republics from Soviet Union. ....Yanaukovich sides with Russia and says no to NATO and then a coup in Kyrgistan and ofcourse, forgot that Yuschenko almost died after winning the Orange Revolution by poisoning. And,almost forgot Vladimir Putin coming for a friendly visit to Kyiv soon and strangely enough,NOT Medvedev...Things seem to be going right on schedule!! Perfect timing! !